If you are making these dumplings ahead, freeze the pleated potstickers. After several hours, the dumplings should harden. Transfer the frozen dumplings to a freezer bag. DO NOT store pleated, uncooked potstickers in the refrigerator. The moisture from the filling will seep into the dumpling skin, and your dumplings will be a soggy mess. Add the ground chicken to a bowl and set it aside. Note that if you are buying 1 pound of ground chicken in a pre-packaged container, the meat doesn’t actually amount to 1 pound. The meat is usually only 14.5 to 15 ounces and the watery sac below the meat amounts to another pound. Don’t worry, that amount of meat will work just fine for the recipe. Heat 1 tablespoon of oil in a pan or skillet over medium heat. Add the ginger and garlic and cook for 15 to 30 seconds, stirring constantly. Add the chopped white portion of the cabbage and cook for 1 to 2 minutes minute. Add the green part of the cabbage, scallions, and salt and cook for another minute, until the greens star to wilt. Turn off the heat and let everything cool in the pan for about 5 to 8 minutes. Transfer the vegetables and spices to the bowl with the chicken. Add the soy sauce and sesame oil and stir to combine all the ingredients. Fill a small bowl with water for wrapping the dumplings. Grab a baking sheet for the finished dumplings and a towel to cover the dumplings to prevent them from drying out. Get a spoon for scooping the dumpling filling. Dip the dumpling wrapper into the bowl of water. Rotate the wrapper so that 1/2 or 2/3 of the wrapper is wet, creating a wet border about 1/4 to 1/2-inch wide. Place the wrapper on your left hand, the wet side facing away from you. Place about 1 tablespoon of filling into the center of the wrapper (you may use more or less depending on the size of your dumpling wrapper). Pinch together the wrapper on the right. Using your index fingers, create a pleat. Seal the pleat towards the right. Continue creating and sealing the pleats to the right until you reach the end of the dumpling. Use the photos above or this video as a reference. If you want the dumpling pleats to go in two directions, towards the center, start folding the dumpling together like a taco. Pinch the wrapper together in the center (the left and right sides of the dumpling are not sealed. For the pleats to the right of this center pinch, you want to create pleats with your index fingers and seal them facing the left. For the pleats to the left of the center pinch, create and seal the pleats facing the right. Continue pleating dumplings until you are out of filling or dumpling skins. If you notice that the dumplings are starting to dry out, cover them with a dry towel. Heat a large nonstick pan with 1 1/2 tablespoons of oil over medium-high heat. I use a 12-inch nonstick pan. Arrange the dumplings over the pan. I usually cook about 15 to 17 dumplings at a time. Pan fry the dumplings for 2 to 3 minutes, until the bottoms are golden. Next, hold the pan lid with one hand and pour about 1/4 cup of water into the pan with your other hand. You want just enough to cover the bottom of the pan. When the water comes in contact with the hot oil, there will be a lot of splattering, so use the lid of the pan as a shield. Cover the pan, reduce the heat slightly to medium, and cook for 6 to 7 minutes. Uncover the pan and let the dumplings cook for another minute or two, until the water is evaporated. Transfer the cooked dumplings to a plate. Repeat this entire cooking process if you want to cook the remaining dumplings. If you want to cook the dumplings later, freeze them. Mix all the dipping sauce ingredients together. I like preparing the sauce 30 minutes before serving. This allows the sauce to fully absorb the herbs and spices in it. 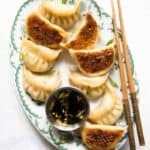 Serve the potstickers with the dipping sauce. These potstickers also go very well with my sweet chili sauce. *Refer to the photos above to see how you should chop the vegetables.